Getting to my next country wasn’t the easiest task. I did not realize how insane the Sao Paulo traffic would get and calculating to be 3 hours in advance for a 40 minute trip to the airport was apparently not enough time, so I ended up missing my flight. I arrived 10 minutes late for the check-in, totally hysterical and hyperventilating, since I had never missed a flight before. A lady who had also missed her flight gave me some chewing gum and told me it would all be all right, and she was right. I could catch the next flight the next morning without any additional charges! Going back to the city that evening would be too much of a hassle, so I decided to spend the night at the airport. I didn’t get any sleep though since there weren’t many chairs without armrests to lie on. I had managed to occupy one, but a homeless woman kept hassling me in Portuguese and was vulturing over the wanted spot so I decided to give up the battle and let her have it. I would have probably gotten robbed anyway if I had fallen asleep in it. I was going to stay a few days in Lima with Arniela, a Peruvian friend I had made in Amsterdam. Since I wasn’t arriving in the evening anymore after missing my flight, Arniela came to pick me up with a taxi in the morning right before heading off to university. When she saw how tired I was, she dropped me off at her grandmother’s place close to uni to get some sleep before meeting up for lunch at the university. With a quick in and out of Arniela, I was left with her incredibly sweet grandmother, with who I chatted a bit in a non-existent Spanish from my side and a handful of English words on her side. After a much needed nap I made my way to the university on the local busses, which reminded me a lot of the Brazilian local busses in the middle of nowhere. No real stops, no real destinations, just a man hanging out of the window shouting where the bus was going. Arniela still had classes in the afternoon, so after lunch I hung out at her university campus. Wifi on my netbook, coffee and comfy couches was all I needed to be left for 5 hours on the campus. 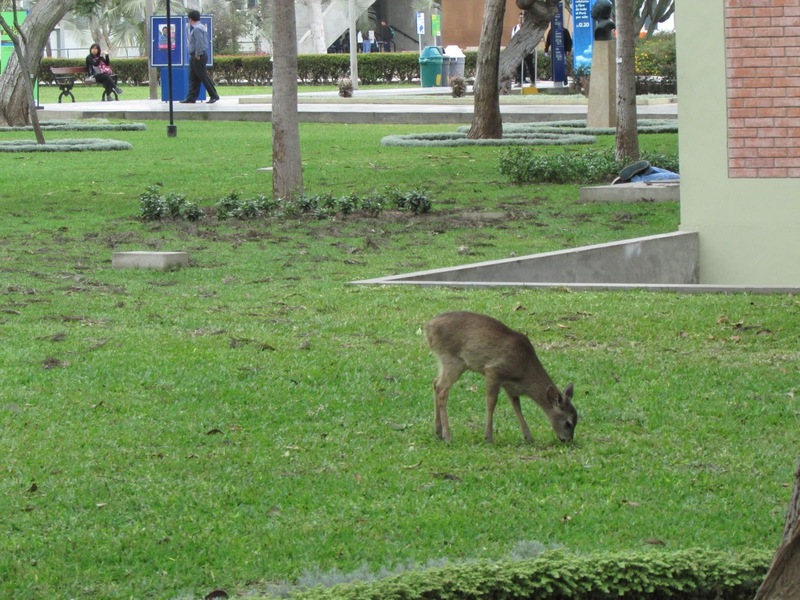 I didn’t have anything I absolutely wanted to see in Lima anyway so I was okay with being left on this wonderful campus with deer walking around stealing people’s food from their table and Peruvian cultural performances with down-syndrome children. We took a taxi to Arniela’s place which was in a community in the middle of a huge park outside of Lima where busses don’t come. It seemed very weird for me to take taxis everytime to get in and out of your house, but Arniela and her family had a fixed taxidriver, and it was a lot cheaper than getting your own car. 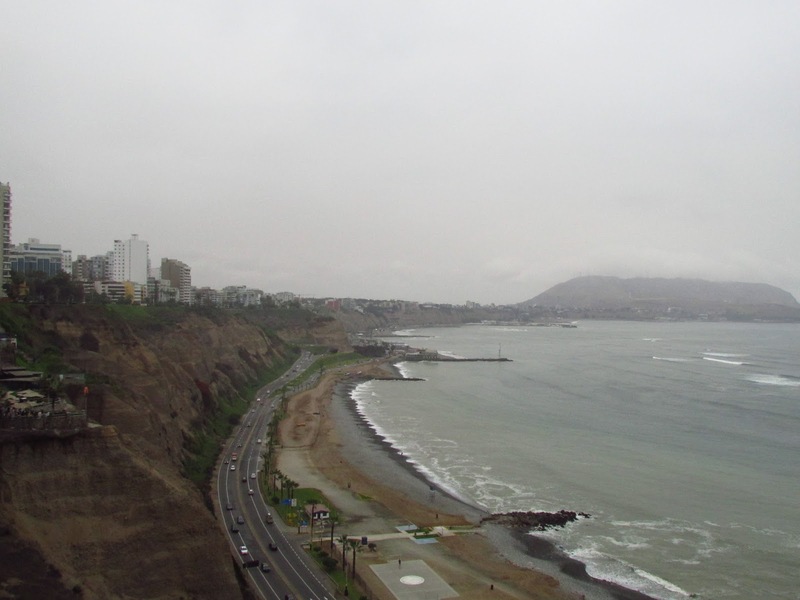 The next day Arniela showed me around Lima a bit and I saw the Pacific ocean for the very first time. The rigged coastline of Lima was pretty impressive and I liked Lima more than I would have expected, but mostly because my expectations had been set really low by everyone warning me how ugly and dangerous the concrete jungle of Lima is. Temporary 'retarded decisions' make the best stories ;-).